GCU doctoral learners took a break from the intensity of residency for a taste of campus life on Wednesday. The Kachina Ballroom at the Squaw Peak Pointe Hilton in Phoenix became GCU Arena for an hour as learners were treated to a midweek Chapel. 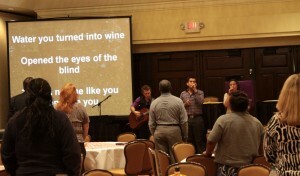 Ryan Maguire, GCU’s online ministry coordinator and staff chaplain, provided the message and a smaller Chapel band — consisting only of Campus Music Minister Gabe Salazar and band members Jeannette Montenegro and Jason Richard — provided the music. 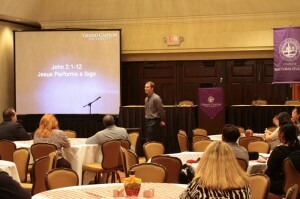 Staff Chaplain Ryan Maguire presented to more than 30 doctoral learners. Maguire based his message on Jesus’ miracle at the wedding in Cana in John 2, specifically citing Mary’s faith in her son. Maguire said that Jesus performs miracles so that we may know who He is. By knowing Him, we also can believe in Him and know that He lives. Dr. John Kilroy, GCU’s director of doctoral learning communities, asked for a dedicated Chapel time in his preparations for the first doctoral residencies in 2010. It was summer and the doctoral students stayed in the empty residence halls and ate in the Student Union. That group held Chapel on Wednesday after dinner in the Union. Campus Music Minister Gabe Salazar, Jeannette Montenegro and Jason Richard led the music. This is the first fall residency and includes 103 students, most of whom are teachers who have taken the time off from work with no pay. The residency is an intense week of sessions as students wrap up their studies and prepare their dissertations. While in town this week, students and their guests attended Tuesday night’s men’s basketball game, toured campus and had dinner in the Union. Thank you for this inspiring news. This is a confirmation that most of us are in the right place. When I attended the Residency this past summer, July 2011, I met so many wonderful people. Dr. Lisa was encouraging. Dr. Kilroy was so personable. The Chapel service held during Residency gave the Scripture Romans12:1-3. What a verse to keep close during this time and once we attain our goals…from now on. Thank you for such a wonderful experience GCU.